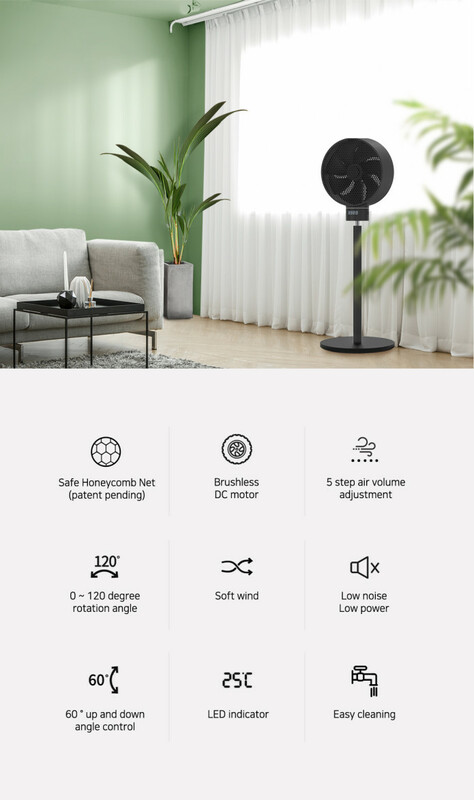 COOLEAN 12-inch STAND FAN with special honeycomb structure safety net, MYUNG SUNG Inc.
To make better wind, several research and tests about different types of nets, blades, frames, etc. have been done. Here's the best and optimal combination! Not a wind that stimulates my body, but a soft and comfortable wind comes through COOLEAN's unique honeycomb design. 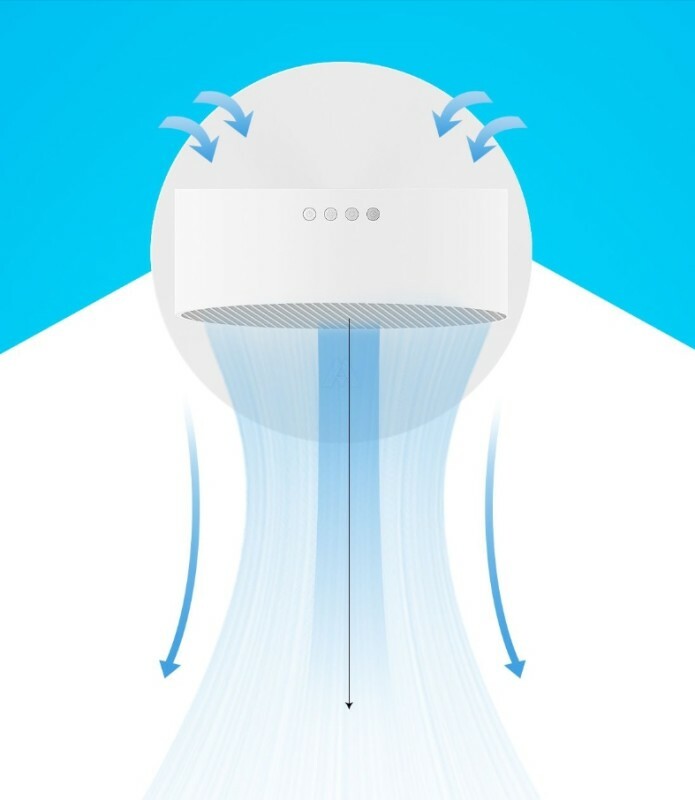 A total of 5 levels of wind volume can be adjusted and there are a ultra-soft wind of 1.8 m/s wind speed resembling a wind of folding fan and a natural wind resembling a natural breeze repeating strong and soft winds. Experience the cool, yet gentle, non-irritating wind which is not a wind that breaks our balance or disturbs your breathing. #2, NO worries about safety. A tightly designed honeycomb safety net reduces the risk of safety accidents that threaten children. Unlike the radial safety nets, where the fingers are pressed with little force, COOLEAN reduces the risk of accidents by designing a dense, durable honeycomb structure. 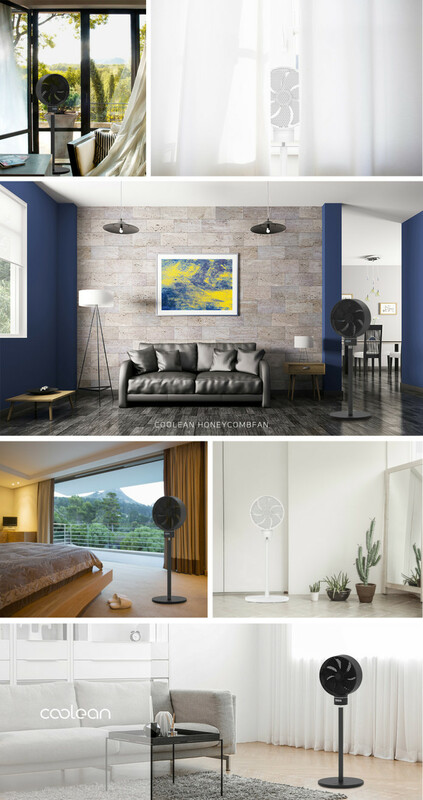 Use this COOLEAN Fan without worrying about safety this summer. * Children's finger-trapped accidents are one of the most common accidents that happen every year. 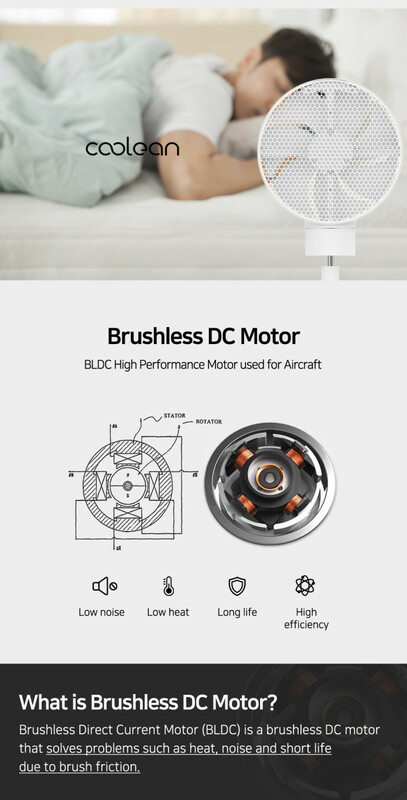 The upgraded BLDC motor (Brushless DC motor) is more advanced than general DC motor. It creates a good environment to sleep and concentrate. 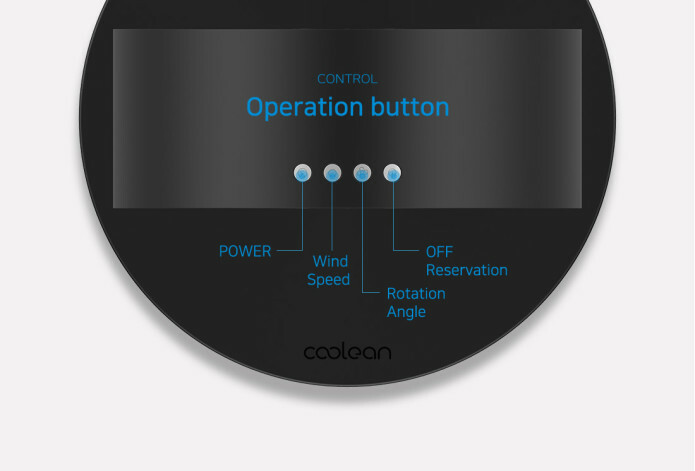 COOLEAN minimizes the noise in the low wind speed level so that your 'Honey-like' break is not disturbed. 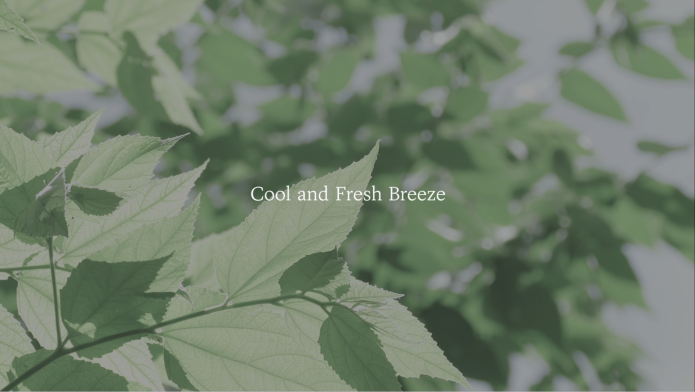 Spend a relaxing summer with soft non-irritating silent breezes of COOLEAN without noise. #4, there is NO unnecessity. Minimal design that does not disturb your space! It will be a special point for your house interior design and practicality is considered. It is easy to assemble and store! 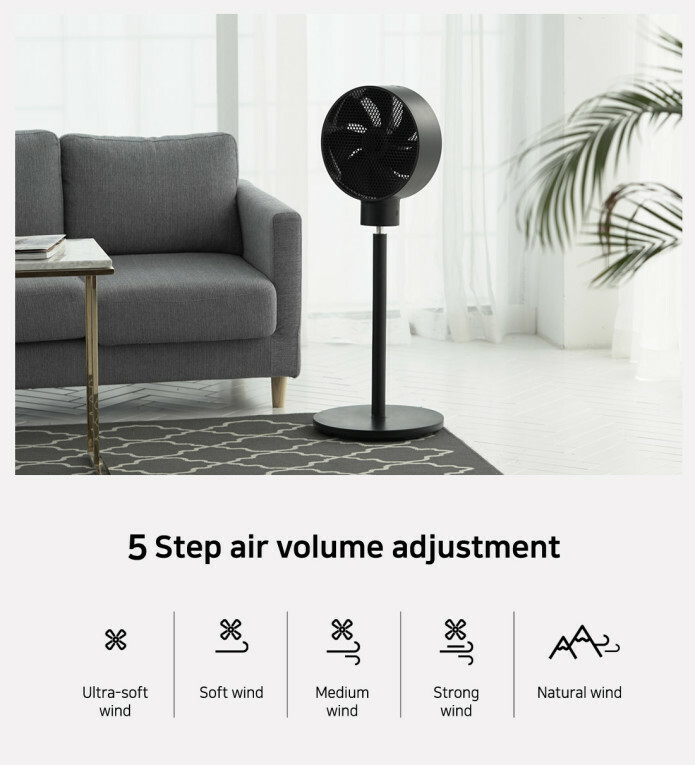 COOLEAN Fan satisfies both price and feeling. Black or white, choose the one that is more suitable for your space! 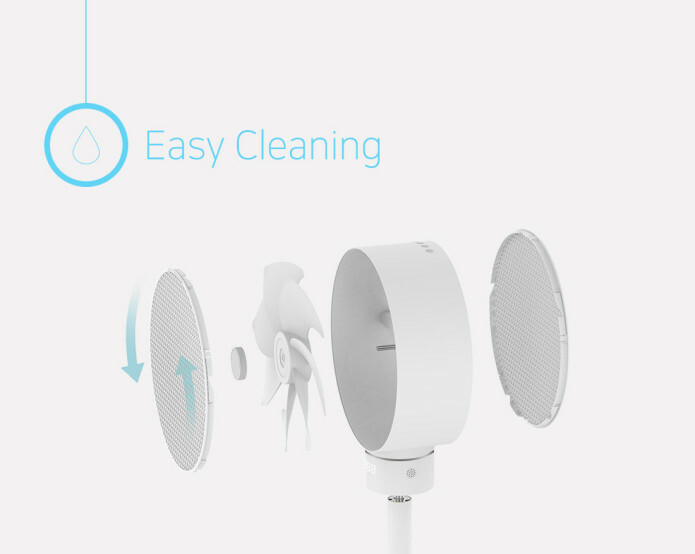 Easy to remove the net and easy to clean! Unlike the usual shape the fans with a motor behind fan blades, COOLEAN Fan has a motor on the bottom of the wings. This structure allows the front and rear safety nets to be separated easily and cleaned. COOLEAN has adjustable neck angle up and down 20 degrees. 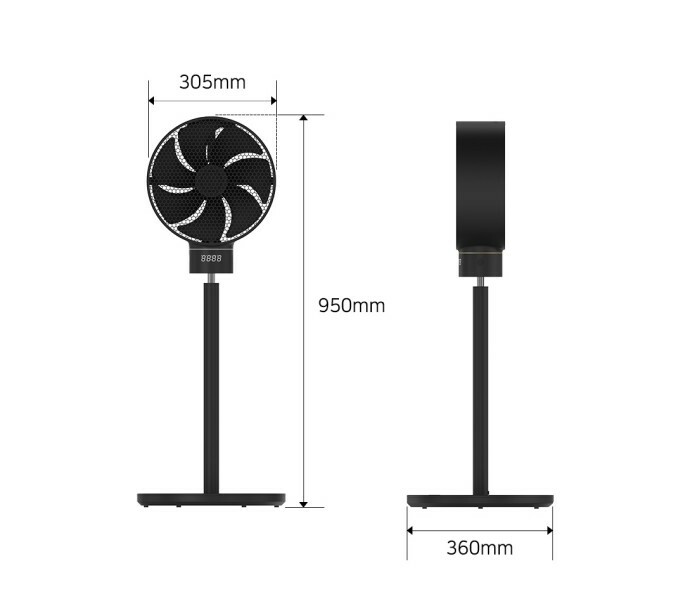 It also has a special rotation angle setting function and can set the desired rotation angle of 30 degrees, 60 degrees, 90 degrees, and 120 degrees. Set your own rotation angle as you like! 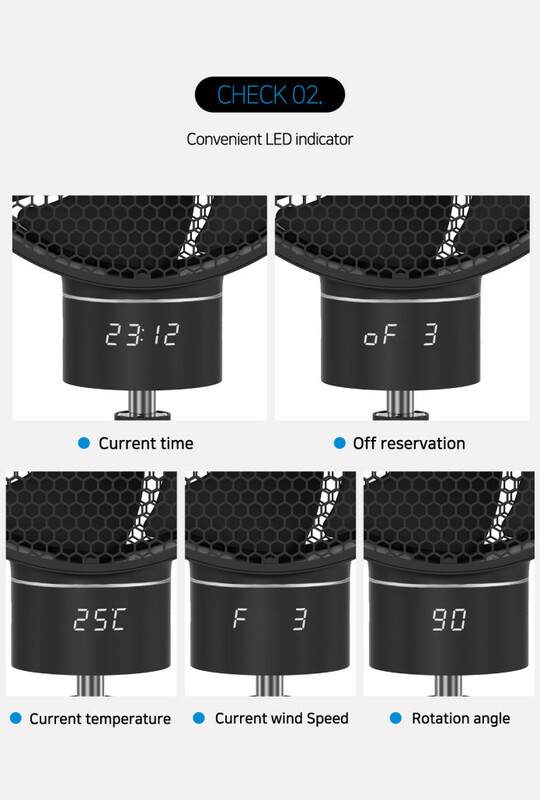 LED indicator at the bottom of fan head indicates the current time and temperature all the time. You can easily check them as it indicates the contents whenever you press each operation button. It is set with soft light that does not interfere sleeping. * Please note that the current temperature may differ from the actual temperature by 1 to 2 degrees. 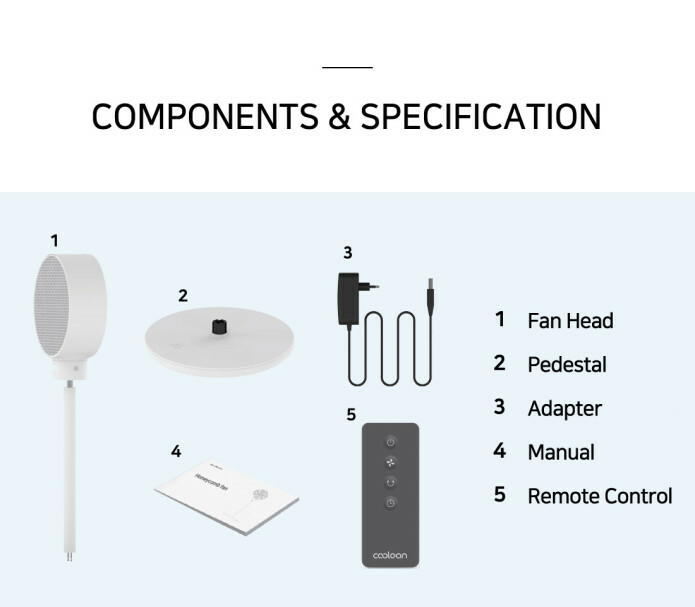 The control panel is located on the head part that you can easily operate the fan without having to bend your waist or knees. The remote control is also included in the components making it easy to use the remote control from a distance!